The Playgoer: How Much is a Best Musical Tony Worth? How Much is a Best Musical Tony Worth? 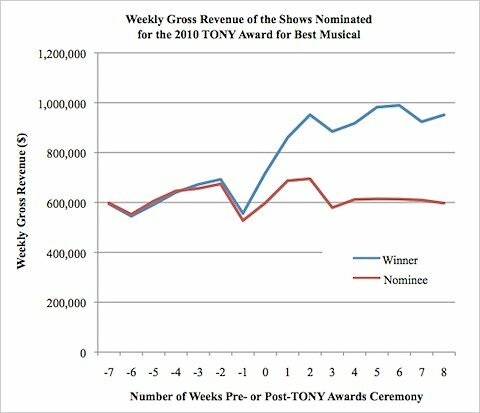 On average, winners of the Tony for best musical saw their average weekly gross jump 48 percent, from $656,784 in the eight weeks before the ceremony to $972,006 in the eight weeks after. By contrast, the other nominees saw only a 21 percent increase in their weekly gross in the comparable time frames. Of the 11 winners during this period, seven were already hits. So are you a hit because of a Tony Award, or do you get a Tony because you're a hit?